This approximately 74-acre country Estate consisting of 3 separate and private homes ( one EXQUISITELY redone by an interior designer), each on their own tax parcels. 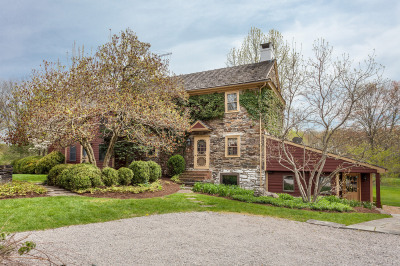 A private lane into the property leads you to a picture-perfect early stone farmhouse, ca. 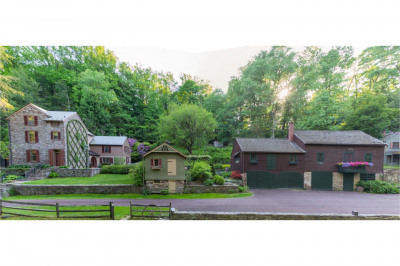 1700, in a Currier and Ives setting complete with a small red barn/garage, a stone springhouse, and an old stone ruin. This picturesque setting is surrounded by magnificent sculptured English boxwood gardens, pergolas of festooning wisteria, and the stone ruins, perfect for vegetable gardens or a beautiful perennial garden. The landscape creates a fairyland of gardens to walk through where you can disappear into your own world. MAIN HOUSE: The stone farmhouse is a bank house with a lower level consisting of a mudroom entrance, newer country kitchen opening to the dining room with walk-in stone fireplace, beautiful exposed stone walls, beamed ceilings, and tiled floor (under carpeting), laundry room, full bath, and large screened porch. The main level (2nd level), has a large living room with main entrance, beautiful random pine floors, built-ins, beamed ceiling, wood stove and views overlooking the fenced pasture and sweeping lawns. The master bedroom addition (1970s) is also on this level with its own entrance right off the formal garden area which is ground level. The master bath has a hallway of closets, separate tub, shower and a cedar sauna. The upper level has 4BRs, 1.1 baths, pine floors throughout. The main house with outbuildings, lovely pool and gardens, is on 2 acres with another 27.9 acres of woods and fields, beautiful large pond, each on its own tax parcel. SECOND HOUSE: A long lane winds through the property past a tennis court and shuffleboard to a beautiful spring-fed pond with aerators and gazebo to a lovely 4BR colonial with large living room and woodstove and great open kitchen/dining area, a large screened porch, and a separate 3-bay meetinghouse-style garage/workshop. Separate tax parcel. Total 37.06 Acres. THIRD HOUSE: This EXQUISITE COMPLETELY REDONE, very privately home situated contemporary in the woods on 6.03 acres offers a wonderful open floor plan, great room with woodstove and an open staircase to 3BRs, 2 full baths. This is a great home for your visiting guests (OR YOU) to enjoy their own get-away. Glass sliding doors on one side which faces a clearing, gives plenty of natural sunlight throughout the house. Every inch of this home has be redone by the owner/interior designer! Main room and dining room chandeliers are Hubbard Forge handmade in Vermont; Antler chandelier by Devonia Antiques; flooring is reclaimed heart of pine; Refrigerator and refrigerator drawers are Subzero; Aga dual fuel range, Soapstone counters, Island top is antiqua bianca; kitchen sink is carved granite; Kohler plumbiing fixtures; Tile in foyer and first floor bath are from Barca Carona, Italy and counter top is St. Laurant marble and walls are Equipp ceramics from Spain; 2nd floor bathroom countertop is Forest Green Granite with leather finish, floor is from Barca, Spain and walls are from Settecento, Italy. You WILL NOT be disappointed..... This property is unlike any other property!!! Family compound OR potential for subdivision since there are already 3 separate parcels so you could potentially sell off one or two of the LOTS. Amazing potential AND amazingly beautiful property! !